This engaging and topical lesson considers the issues surrounding economic migration to Qatar. Migrants have been building the infrastructure for the 2022 World Cup, but the conditions in which they have been working have been highly criticised by the media. A fun memory house/mind palace activity - students listen to the story and place case study detail around their house! 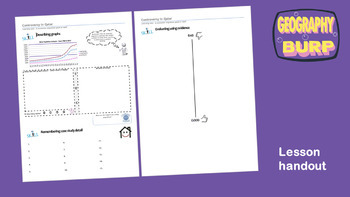 This lesson has been piloted, fine-tuned, and then fully implemented across three different schools, resulting in a high-quality resource that can be used 'as is' or tailored to your needs. An excellent addition to any population, migration or Geography in the News topic. 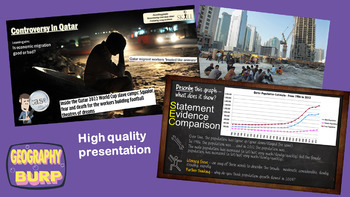 Please have a look at my other resources by exploring my shop or visiting GeographyBurp.co.uk.